That was exactly what the Knorr Taste Quest contestants did after an unimpressive week. Cue in the shaku shaku dance. It was fun to watch but sadly, the judges were unimpressed. In the words of Chef Fregz, “Shaku Shaku ain’t gonna shak you all the way to 5 million naira”. One thing is clear, shaku shaku should be left on the dance floor, not the KTQ5 kitchen floor. Now to the tasks of the week! There were three tasks and the theme of the tasks was “Simplicity”. First up was a starter dish to be made in 20 minutes with chicken, potatoes, plantain, corn, tomato, peppers and vegetables. 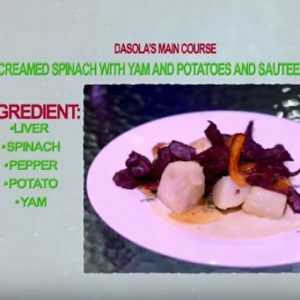 Sadly, the judges were still unimpressed but Daphne and Gbolabo’s meals caught my eyes. Daphne’s Plantain pepper soup and Potato veggies stood out to me. There was a lot of improvements from the contestants on this task. 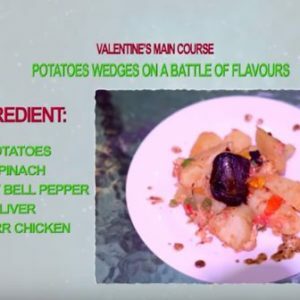 Valentine’s Potato Wedges on a battle of flavor and Dasola’s Lipton tea infused liver sauce definitely caught my attention. The third task was a dessert and Shasi’s dessert stood out for Dr Robert as the best dessert tasted on the show. Accolades mehn! You just have to bow when you hear this kind of comment from Dr Roberts. At the end of the 3 tasks, Gbolabo emerged victorious with Valentine coming in a close second and Dasola in third position. With an uncooked chicken, lemon tasting rice and an overly peppery and salty soup, Love failed to deliver on her task and was evicted alongside Adamu. Right now, there are 8 contestants left, is it too soon to predict the winner will be a man? I hope the ladies prove me wrong. Who do you think would be leaving the show this weekend?